All of our DVDs are "Original Factory New" and are Region 1 or 0 (NTSC). Blu-ray discs do not play in a regular DVD player, you need a Blu-ray Player to play them. It’s the original title of what we know in the US as DOCTOR BUTCHER, M.D.. Crazy doctor Obrero set up shop on the isolated island of Keto so he can conduct his “zombie experiments” in relative peace. After a gruesome flesh-eating cult does some nasty deeds in NYC, a couple of nosy do-gooders head out in search of Obrero and get caught up in his gruesome experiments. Widescreen print with trailer, photo and still gallery, interviews, and scenes added to the beginning of the US “Dr. Butcher” version. Out of print DVD. Blu-ray and DVD Combo Pack - It’s the original title of what we know in the US as “Doctor Butcher, M.D.”. Crazy doctor Obrero set up shop on the isolated island of Keto so he can conduct his “zombie experiments” in relative peace. After a gruesome flesh-eating cult does some nasty deeds in NYC, a couple of nosy do-gooders head out in search of Obrero and get caught up in his gruesome experiments. Widescreen print with trailer, photo and still gallery, interviews, and scenes added to the beginning of the US “Dr. Butcher” version. You get both the Blu-ray disc, as well as the regular DVD in this two disc set. Here we have four zombie classics (or not so classics as the case may be) on two DVDs that come packaged in a cool tin box. You get George Romero’s classic NIGHT OF THE LIVING DEAD (1968). REVENGE OF THE ZOMBIES (1943) with John Carradine as a Nazi scientist creating zombies in the swamps of Louisiana on one disc. Jess Franco’s story of Nazi’s protecting their hidden old in OASIS OF THE ZOMBIES (1981). Along with the Bela Lugosi classic, WHITE ZOMBIE (1932), on the second disc. Like most of the DVDs we sell, this collection is now out of print. Now with new cover art. aka Crypt of the Living Dead. Two archaeologists on a scientific dig in a place known as Vampire Island, uncover and release Hannah, a 13th century vampire, who now plans on making the islands residence a nice tasty snack. Widescreen version of the Matt Dillon, Kate Hudson, Owen Wilson and Michael Douglas comedy. Signed by Matt Dillon on the DVD cover in blue sharpie. Opened so Dillon could sign it, but in Very Good condition. DVD w/ signed cover. From Japanese filmmaker Tamakichi Anaru comes this tale of a young woman who’s husband leaves her for another woman. She begins self mutilation to cope with the personal pain… Available on DVD for the first time. Blu-ray and DVD Combo - Director Kevin Tenney’s cult 80’s horror film about The Lauder House. Plagued by strange and violent occurrences, unexplained deaths, and supernatural activity, the place has remained empty for years. Now, new owners decide to turn the old mansion into a bed and breakfast so a team of paranormal experts attempt to remove the demonic forces and cleanse the property of the evil that lurks at every turn. But, as soon as they arrive, members of the team begin to meet their bloody end. With Linnea Quigley, James Quinn, and Kathleen Bailey. Includes commentary, interviews, trailer, short film, and more. Includes both the Blu-ray and standard DVD versions of the film. Bikers. Babes. Revenge. Roger Corman’s Wild Angels set the stage for biker films to come. When a bike is stolen from the Hell’s Angels, an epic chase to retrieve the motorcycle is set in motion. And when it comes to bikers, mayhem follows wherever they go. With Peter Fomda, Nancy Sinatra, Bruce Dern, and Diane Ladd. Now out of print DVD. Blu-ray / DVD Combo - A supernatural circus run by a vampire returns to the 19th century town to avenge the death of Count Mitterhaus, who was killed by the town fifteen years earlier for the death of a little girl. Mitterhaus cursed the town and vowed that their children would pay for their crimes... Now it appears the curse is coming true! This Hammer Film horror classic was one of the better films the company put out in the 1970’s. It’s finally seen its day on DVD, complete with a making of featurette, a history of circus horror, a look at House of Hammer magazine, trailer and more. Includes both the Blu-ray and standard DVD versions of the films. Blu-ray and DVD Combo - One of cult actor Joe (Maniac) Spinell’s final films finds him playing Roscoe, the town undertaker with a secret. Seems he keeps a bloody collection of human souvenirs. And when townspeople begin to disappear, Roscoe’s nephew starts to grow suspicious of his uncle. Available until this point as a heavily censored version and/or bootleg video, this version is complete and mastered from the original camera negatives. Includes interview and commentary with director William Kennedy, featurette, outtakes, and more. aka Psycho: The Snuff Reels. In the grisly psedu snuff film tradition comes this gut puncher from underground Japanese filmmaker Tamakichi Anaru. It’s basically a chronicle of the final moments of life, and the notorious death of a young actress. Available on DVD for the first time. According to Dr. Diablo, he and his sideshow torture exhibit have the power to warn people of the evil that lies in their future. As skeptical customers are shown their fate, one of them tries to make a deal with Diablo... The Devil! Classic horror anthology from Amicus Productions stars Jack Palance, Burgess Meredith, Beverly Adams and Peter Cushing. No frills DVD, but a rare horror classic that recently went out of print. And it looks uncut too! Special Edition - Tobe Hooper’s cult horror classic is much more frightening than the remake will ever be. And this widescreen surround sound print looks and sounds great too. Also includes commentary from Tobe Hooper, Gunnar “Leatherface” Hansen, and DP Daniel Pearl, deleted scenes, blooper reel, trailers and TV spots and more. Out of print DVD. *Please note the actual dvd has a metallic cover that did not scan well. 2-Disc Meltdown edition - In a world of winos and derelicts, two homeless brothers find themselves living in a tire hut in the back of a vast auto salvage yard in lower New York. The most lethal threat comes from a case of bad hootch known as Tenafly Viper sitting on the counter of Ed’s liquor store. Seems the stuff went bad... Real bad. And anyone taking even a sip melts down within seconds. The bums are eating the stuff up. You see, it’s only a buck a bottle! One of the last great independent exploitation films, Street Trash delivers the goods in spades. Single Disc Edition - In a world of winos and derelicts, two homeless brothers find themselves living in a tire hut in the back of a vast auto salvage yard in lower New York. The most lethal threat comes from a case of bad hootch known as Tenafly Viper sitting on the counter of Ed’s liquor store. Seems the stuff went bad... Real bad. And anyone taking even a sip melts down within seconds. The bums are eating the stuff up. You see, it’s only a buck a bottle! One of the last great independent exploitation films, Street Trash delivers the goods in spades. During the Civil War, three Confederate officers sell out the Yankees and allow enemy troops to slaughter the entire company... except for one man we’ll now call The Stranger, who sets his sights on revenge in THE STRANGERS GUNDOWN. Here’s 44 classic Spaghetti Westerns on eleven discs that feature well known stars of the genre like Terence Hill, Lee Van Cleef, Chuck Conners, Jack Palance, Franco Nero, Bud Spencer, and others. Everything from the gritty to the silly is represented in films like: 3 BULLETS FOR RINGO (1966), AND GOD SAID TO CAIN (1970), APACHE BLOOD (1975), BEN AND CHARLIE (1972), BETWEEN GOD THE DEVIL AND A WINCHESTER (1968), BEYOND THE LAW (1968), BOOT HILL (1969), CHALLENGE TO WHITE FANG (1974), CHINA 9 - LIBERTY 37 (1978), DEAD FOR A DOLLAR (1968), DEAD MEN DON’T MAKE SHADOWS (1970), DEATH RIDES A HORSE (1968), THE DESERTER (1971), DJANGO KILLS (1967), DJANGO VS SARTANA (1970), THE FIGHTING FISTS OF SHANGHAI JOE (1972), FIND A PLACE TO DIE (1968), FISTFUL OF LEAD (1970), FOUR OF THE APOCALYPSE (1975), FOUR RODE OUT (1969), GRAND DUEL (1974), THE GREAT ADVENTURE (1975), HATE THY NEIGHBOR (1968), HIS NAME WAS KING (1971), IF YOU MEET SARTANA PRAY FOR DEATH (1968), IT CAN BE DONE AMIGO (1973), JESSIE AND LESTER (1972), JOHNNY YUMA (1966), KEOMA THE AVENGER (1976), KID VENGEANCE (1977), THE MAN FROM NOWHERE (1966), THE MANHUNT (1985), MANNAJA: A MAN CALLED BLADE (1977), MINNESOTA CLAY (1965), THE PRICE OF POWER (1969), RUN MAN RUN (1968), THE STRANGERS GUNDOWN (1969), SUNDANCE AND THE KID (1975), THEY CALL HIM CEMETERY (1971), THIS MAN CAN’T DIE (1967), TRINITY AND SARTANA (1972), THE UNHOLY FOUR (1970), WHITE COMANCHE (1968) and WHITE FANG AND THE HUNTER (1975). 44 movies on 11 DVD's. Hail to the king baby! Ash is the latest addition to the Living Dead Dolls family! It's Ash from the film Evil Dead 2 and he is ready to spray some deadite brains all over aisle 5. Straight from the classic horror comedy Evil Dead 2, comes the unlikeliest of heroes. Ash comes will his chainsaw hand, a rifle, and a Necronomicon. Groovy! Ash stands approximately 10" tall. Packaged in window box. Blu-ray DVD - An experimental government germ weapon that leaves victims insane or dead is accidentally released in the water supply of Evans City, Pennsylvania, and the small community becomes a war zone. As the madness spreads and the military starts shooting, a small band of people attempt to escape the madness in one of George Romero’s most underrated films. New 4K restoration, includes commentary, location tour, interviews, alternate opening titles, trailers, TV Spots, and more. *Please Note: This is a Blu-ray DVD, so it won’t play in a standard DVD player. Blu-ray Disc - As a boy, Tommy’s satanic cult leader grandfather murdered his on Halloween night in a bloody ritual. Now, on the eve of Tommy’s 18th birthday, his grandfather is ready to indoctrinate him to the ways of the black arts. Unfortunately, a masked killer has other plans for the people connected to Tommy. From the depths of old VHS bootleg Hell comes this 2K restoration from the original negative. Includes commentary with the producer, featurette, interviews, and more. Blu-ray Disc - Horror novelist Roger Cobb (William Katt) moves into a strange old house left to him by his late aunt in order to finish his latest book and get over the disappearance of his son. Already on the edge, Cobb’s sanity comes under siege by nightmares, visits from a nosy neighbor, and an onslaught of other worldly creatures from another dimension in this enjoyable cult horror-comedy from director Steve Miner. Includes commentary with director, producer, and stars; making of documentary, trailers, TV spots, and much, much more. 3-Disc Limited Edition Blu-ray Box Set - On the eve of her 17th birthday, Mari and her friend Phyllis set off to attend a concert. Attempting to score some weed on their way to the show, the girls wind up in the clutches of the sadistic Krug, Weasel, Sadie, and Krug’s junkie son. Bound, gagged, and tossed into the trunk of the group’s car, the worst is yet to come for Mari and Phyllis. It’s Sean Cunningham and Wes Craven’s cult exploitation flick in a brand new box set that features three different cuts of the film, including the original R rated version, the unrated version (containing a couple extra minutes over the R rated cut) and the Krug And Company version of the film on two blu-ray discs. The box set also features a CD soundtrack, fold-out poster, 6 different collector cards, 60 page book, and plenty of extras, including commentary tracks, interviews, featurettes, trailers, TV spots, and much, much more. 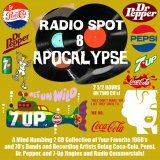 Yes indeed, here we have a two CD collection of 1960’s and 70’s bands and recording artists doing radio jingles and commercials for Coca-Cola, Pepsi, Dr. Pepper and 7-Up. 132 total radio spots sung by the likes of Chuck Berry, Johnny Cash, Ray Charles, the Coasters, Delaney and Bonnie, Neil Diamond, Aretha Franklin, Three Dog Night, The Moody Blues, and so many others. Who doesn’t remember “Things Go Better With Coke”, “I’d Like To Teach The World To Sing” or “It’s The Real Thing” Coke ads. What about those “Pepsi Pours It On”, You’re The Pepsi Generation” or “You’ve Got A Lot To Live And Pepsi’s Got A Lot To Give” radio spots? What about David Naughton singing the “Dr. Pepper: Wouldn’t You Like To Be A Pepper too?” jingle?… Yep, it’s here. Two CD Set. 151 minutes total.